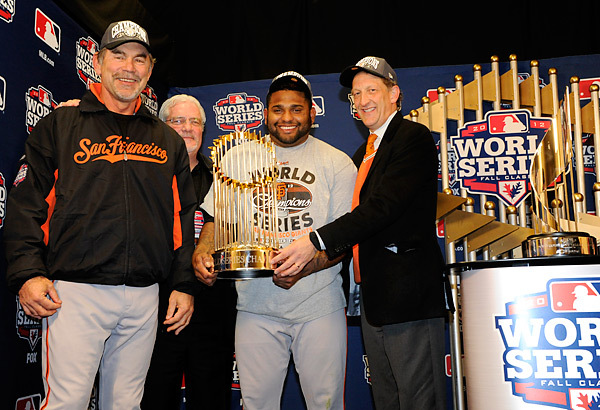 The Giants Win the 2012 World Series – The Trophy Returns to San Francisco! Wow! 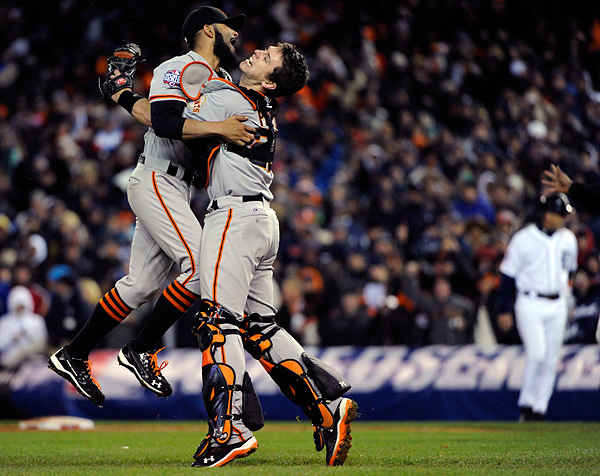 With Hurricane Sandy threatening to throw the World Series into a lengthy delay, the San Francisco Giants rose to the occasion and pulled out an exciting, ten inning 4-3 victory to win the 2012 World Series, returning the Commissioners Trophy back to the City by the Bay after a short one year hiatus. 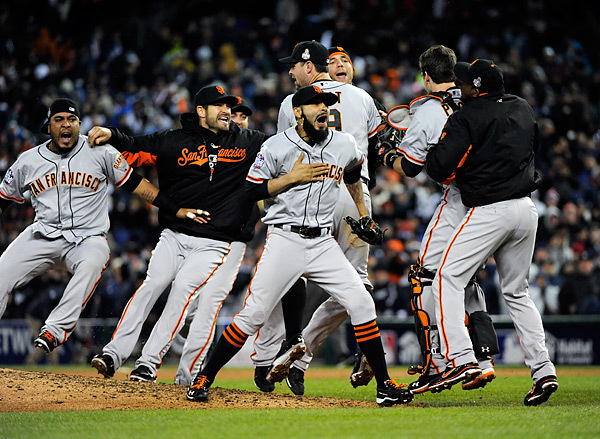 I’m a big fan of going the full seven games most years, but when the aforementioned Hurricane Sandy became a force to be reckoned with even in Detroit, I became a big fan of the San Francisco Giants. Rain was forecast for Monday and Tuesday nights, so an eventual Game Five would not have been played until most likely Wednesday at the earliest, and that forecast might have even been a bit optimistic. I can’t even imagine the travel nightmare that everyone would have encountered had the Giants not have won Sunday night. 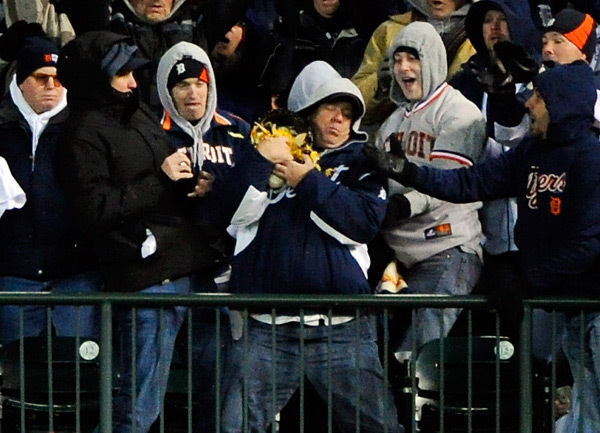 Many of my east coast friends are still in Detroit even as I write this blog two days removed from the clinching game. Crazy! Just think for a monent if the Yankees were playing the Nationals instead of the Giants and Tigers. It could have been. Scary thought! Game Four was cold, wet and windy, yet the prospect of the Series wrapping up this evening made it exciting nonetheless. For Game Four I was positioned in the most unique photo position I have ever shot from, regular season or post season. Due to the lack of field photo positions (television claimed most of the space used by still photographers during the regular season), a request was made to construct a small platform inside of each dugout from which 6 photographers could work from. That’s right, inside the dugouts. After final approval (by Tigers manager Jim Leyland), the platforms were built and put into place. Of course, nothing comes without a price… these positions came with restrictions; we couldn’t shoot into the dugout nor could we leave the dugout, period. Time to dehydrate, cause it might be 4 or more hours from the time we had to be in position until the conclusion of the game. No pain, no gain! I’ve got to admit, being literally inside a teams dugout during a World Series game, with all the sights and sounds that came along with with it was an experience I’ll never forget. 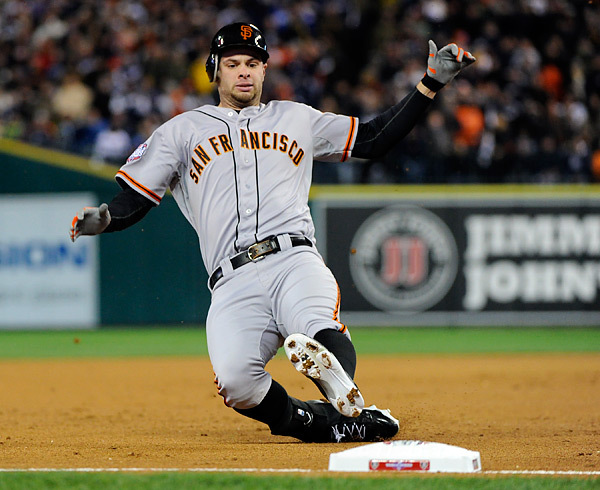 The Giants got on the board first in the second inning when Brandon Belt crushed an RBI triple to deep right field to score Hunter Pence. That lead, however, was short lived as Miguel Cabrera finally showed signs of life, hitting a two-run home run off of Matt Cain to give the Tigers the lead in the third inning. Comerica Park finally came alive! 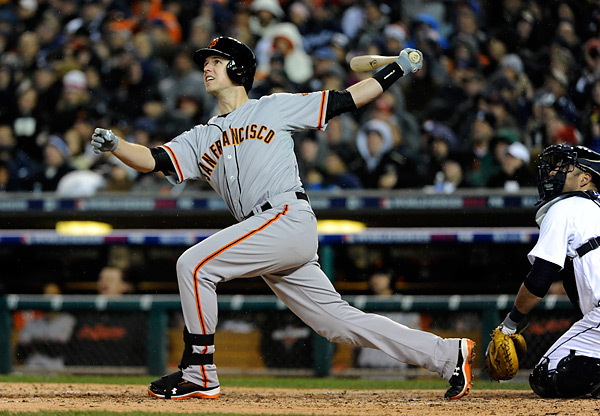 Buster Posey answered Cabrera’s round-tripper with a two-run blast of his own in the sixth inning, giving the Giants a 3-2 lead. 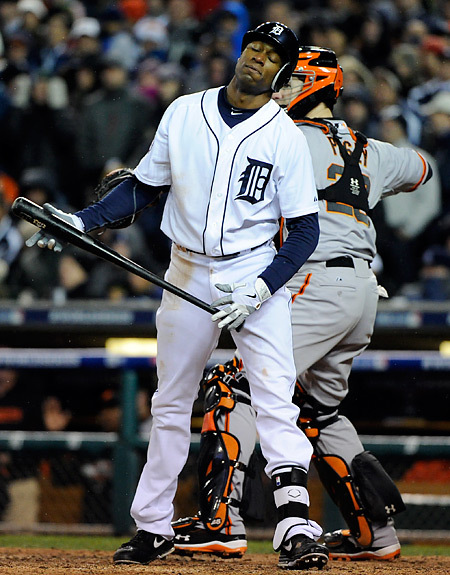 The way the Tigers had been playing this Series I felt semi-confident that perhaps this lead might hold, but Delmon Young quickly proved me wrong when he went yard himself in the bottom of the sixth to knot everything up at 3. It stayed knotted at three until the top of the tenth when Giant spark plug Marco Scutaro came through in the clutch with a two-out RBI single off of Tigers reliever Phil Coke to drive in Ryan Theriot with what proved to be the World Series clinching run. 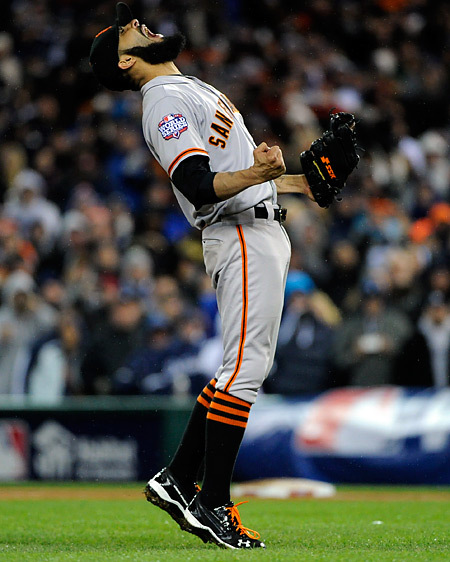 After that, it was time for Sergio Romo to come in and finish up, and Romo did it in grand style when he struck out the side, including getting 2012 American League Triple-Crown winner Miguel Cabrera to strike out looking to end the 2012 season and send the Giants home to San Francisco as 2012 World Champions. My photo position allowed me to make some great celebration images. Being inside the Tigers dugout prevented me from being blocked by players entering the dugout, or from media streaming out of the regular photo position. The best of the celebration only lasts a few seconds, and having a clear shot was crucial. For me, next stop was inside to be one of only two photographers allowed to shoot the presentation of the World Series and World Series MVP trophies while my teammate and Giants superfan Brad Mangin headed next door into the Giants clubhouse to capture the ensuing champagne celebration. 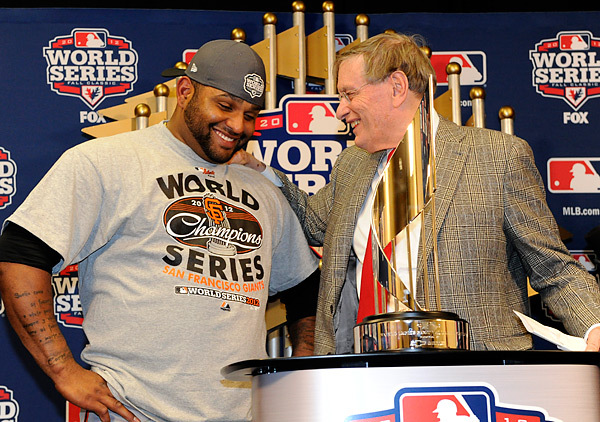 Pablo Sandoval was next up in the interview room as Baseball Commissioner Bud Selig awarded Sandoval with the World Series MVP trophy. 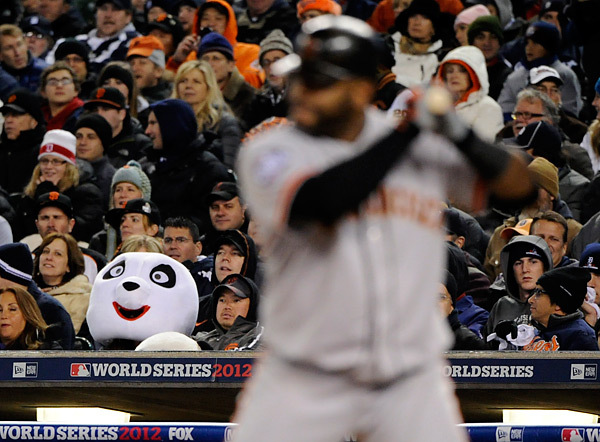 Sandoval had a hell of a World Series, hitting .500 with three home runs and four RBI’s in 16 at-bats. Personally, I was relieved the Giants took care of business in four games, if only so that I could return home safely (via a one-way rental car) and enjoy Halloween with my family. Oh, and before I forget, for those wondering why I didn’t pen a Game Three blog, there were two reasons. One, a lack of time and two, a lack of photos! With the 2012 baseball season officially in the books, I’d be lying if I told you I wasn’t already looking forward to spring training. Only 16 week to go, according to my calendar! This entry was posted on Tuesday, October 30th, 2012 at 3:44 PM	and is filed under Assignments. You can follow any responses to this entry through the RSS 2.0 feed. Thanks for sharing Ron! I always enjoy reading your behind-the-scenes events of photographing a World Series each year. While watching the game I noticed there were photographers positioned inside the dugout, which I thought was fascinating. I’m glad you could shed some light on how that came about exactly.